George Gordon, who died in Berbice. Gilbert's sister, Barbara Gordon married John Macdonald, a farmer in Caithness (died 1840); after his death she and her family went to Canada, and their sons went from there to Surinam. 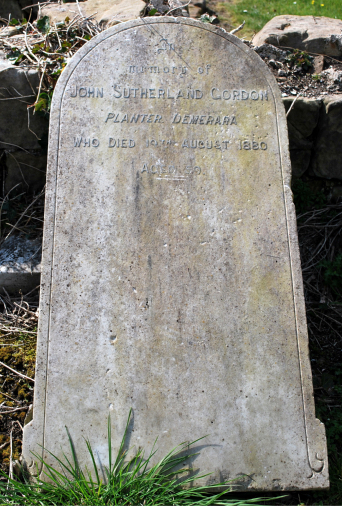 The sons were: Alexander Macdonald, died 1870 and Gordon Macdonald, died in Scotland in 1859. In 1863 Alexander Macdonald received compensation from the Dutch government on the emancipation of 229 slaves on plantations John and Bellevue on the Coronie coast. 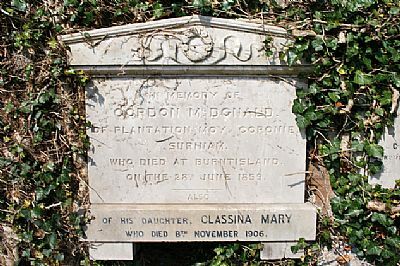 Below: gravestone of Gordon McDonald of Plantation Moy, Coronie, Surinam (Kirkton Old Church, Burntisland, Fife).